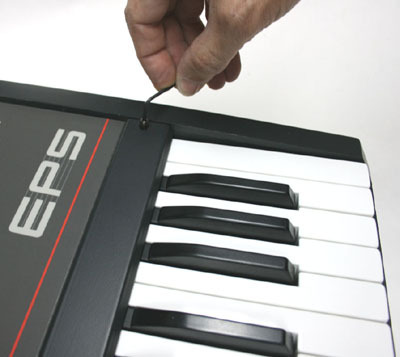 To get to the insides of an Ensoniq EPS, EPS-16-Plus, plastic-case Mirage, ESQ-1, SQ-80, VFX, VFX-sd, or SD-1 keyboard, you will need to remove four screws - one in each corner of the upper panel. These are usually hex-head machine screws, for which you will need a small Allen wrench (as pictured). Some keyboards, though, have Phillips-head screws, so for these you will need a Phillips screwdriver. Once these four screws are removed, lift the front edge of the panel, and pull it open like a car hood (it is hinged along the back edge). It will easily open a little bit - and then it will feel stuck. Go ahead and keep pulling, even when you are worried you will break something! It takes a lot of force to get the top panel to snap away from the studs where the screws mount, but eventually it will come free and the panel will swing open nicely.